You are visiting the "Working-Training" page. The link to the right will take you to sub-pages within the "Working-Training" section. The links with asterisks in front will return you to either the parent or "Home" pages. Click on any thumbnail size image below to enlarge it, then click on your browser's back button to return to this page. I worked at Careg-Wiber for five years. I am hopeful that the pictures on that page will bring to life what a day's work can be. Each farm's work can be different. Although you will see hills in my photographs, the area at Careg-Wiber is not nearly as remote and difficult to work as those mountainous areas pictured on the Wales' page. I also have performed demonstrations for various individuals from time to time. On the "Demos" page, you will see me working Pam on a few Suffolk crosses. I took some pictures of the area near where I now live. The photos are on the "Farmland" page. This Beardie, C.J. had some issues that needed correcting while in Phoenix, Arizona, in 2003. He was a hard headed Beardie that just wanted to work, work, work. He often took advantage of his owner-handler. For some reason, he became quite attached to me. 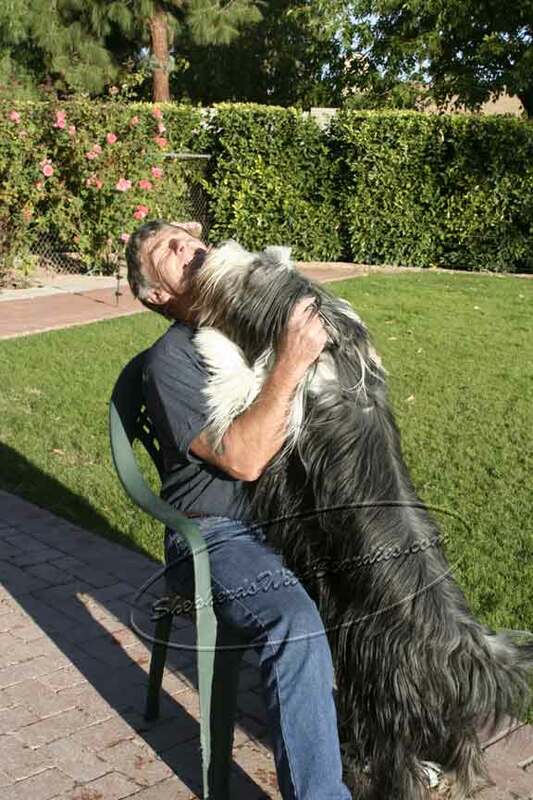 When I returned to Phoenix in 2005, he knocked me over with affection when he saw me. One of his owners just happened to have a camera in hand and snapped this picture. She indicated he never made over anyone the way he responded to me. I believe he had respect for me. That respect is so important when working; respect runs both ways. I was asked by the owner of an Australian Shepherd named Austin to try and solve a particular problem he was having (2003). We quickly solved the problem. I have to say it was HOT HOT HOT in the desert, even though this was their fall-winter months. Working comes in many forms. 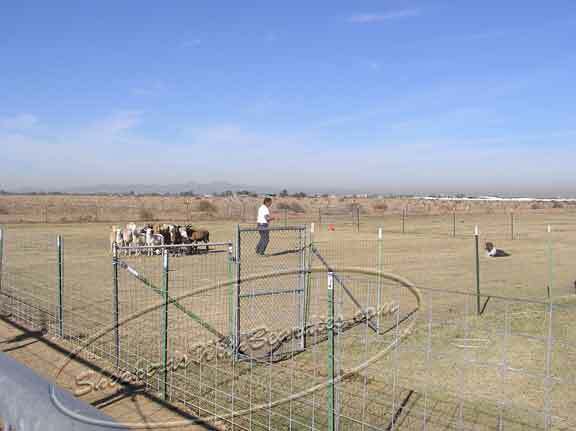 Here I was moving stock from a holding area into the arena for an ASCA trial in Phoenix, Arizona. I met many individuals who said they really appreciated my handling of the stock. The judge commented that the stock was kept very calm which allowed the dogs to have a chance at better runs.